WASHINGTON -- Democratic Sen. Chuck Schumer of New York is threatening political payback if congressional Republicans and President-elect Donald Trump try to undo President Barack Obama’s major legislative achievements. Mr. Trump, after meeting with Obama, said he’d like to keep popular pieces of the six-year-old law, including the requirement to extend coverage to people with pre-existing conditions and the provision allowing young adults to stay on their parents’ health plans until age 26. But Schumer said it was a non-starter to try picking off favored pieces of the Affordable Care Act. “There is no way that you can keep those things without keeping the ACA,” Schumer insisted. He added that he’d made similar points directly to Mr. Trump, but declined to share the president-elect’s response. Congressional Republicans have tried repeatedly to repeal the law that helped some 20 million Americans gain coverage, but they’ve been unable to coalesce around a replacement. Democrats chose Schumer this week to serve as minority leader, replacing Sen. Harry Reid of Nevada, who is retiring after five terms. In the interview, Schumer also served notice on the Dodd-Frank Wall Street reform bill that provided for tougher oversight of financial institutions and created a consumer protection bureau after the 2008 economic crisis. As leader of a 48-member Senate Democratic Caucus next year, Schumer will command enough votes to block majority Republicans from getting the 60 votes needed to proceed on most major legislation. As such, Schumer and his Democrats will be the only backstop against Mr. Trump and the GOP next year when Republicans control both chambers of Congress and the White House. 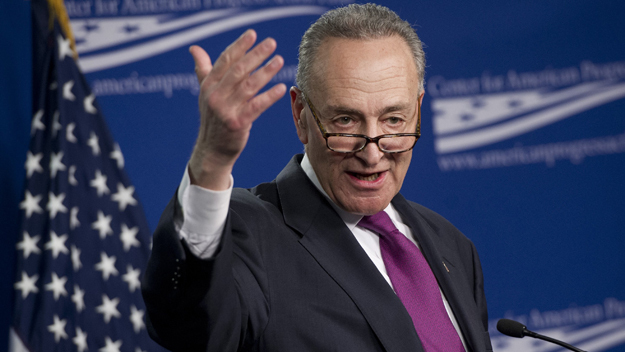 Indeed Schumer argued that on some issues Mr. Trump has more in common with the Democrats than Republicans, suggesting a strategy that would amount to forming alliances with Mr. Trump where possible against the wishes of conservative Republicans and GOP leaders on the Hill. “Donald Trump in his campaign advocated many things or a good number of economic issues that Democrats support and Republicans have opposed,” Schumer said, pointing to trade, spending on infrastructure, and a financial loophole benefiting wealthy Wall Street interests. But he also promised to fight Mr. Trump “with everything we’ve got” when the new president takes an approach opposed to Democratic values. “We’re not going to do something in name only,” Schumer said. On infrastructure, Mr. Trump has proposed a $1 trillion spending program that some conservatives are already balking at. “He didn’t say ‘no,’” Schumer said of Mr. Trump’s response. And unlike demands from conservatives, Schumer said he didn’t think such an infrastructure bill would have to be fully paid for - meaning it could add to the deficit instead - a position he said he believed Mr. Trump might share.